Sperber's Digital Spool Magic Expands Worlds"
The scene inside the top cottage at Byrdcliffe is not what one expects. Step away from the scenic view of Yerry Hill, back to the tall pines, and enter a tall, woody room filled with bright metal workstations lined with computer charts. Thousands of spools of thread, in small boxes, are carefully stacked according to RGB color classifications. On one wall is a massive construction of hanging spools, for the most part in shades of blue and white. "Here, look into this," says artist Devorah Sperber, whose studio this is. It's a reflective orb that immediately lends the wall of thread spools a photo-realist vision of summer clouds. Like magic, given the woodsy, arts and crafts setting of this digital alchemy. What we're seeing, Sperber explains, are sections of what will become a 60-foot sculptural piece to be placed in the Centro Medico Train Station in San Juan, Puerto Rico, part of a major art initiative promoted by the Governor of Puerto Rico, where over 90 public art projects and interventions are being integrated in urban areas, train stations, parks, plazas, beaches and general infrastructure by the likes of such international artist as Ann Hamilton, Vito Acconci, Red Grooms, Jorge Pardo, Ming Fay, West 8, Lo-tek, Dennis Adams, Liliana Porter...and Sperber. "I love symmetry. The clouds will darken towards the outer edges of the work and the whole thing will be viewable via mirrors on the opposite wall of the train station, which has a cathedral-like feeling to it," Sperber says. "Aren't the work stations great? I'm so proud of having created such a good working space here." Sperber first came to town a decade ago to work at Byrdcliffe. She's a Colorado native who's always found the City a bit unnerving, even though she still spends half her life there, living in a Greenwich Village apartment and working out of a building of studio spaces on West 39th Street. She and her husband used to live in what is now her studio. When they bought their own home last year, she decided to covert their former home into an Upstate studio, and eventually hired four assistants to help out with the labor-intensive elements of her unique, critically acclaimed art. McKenzie Fine Art in Chelsea, the art world's ackowledged capital, describes her work in a press release for an upcoming show opening April 22 thus: "Sperber combines commonplace materials with simple optical devices in order to explore the link between art and technology, as well as the connection between subjective perception and reality. 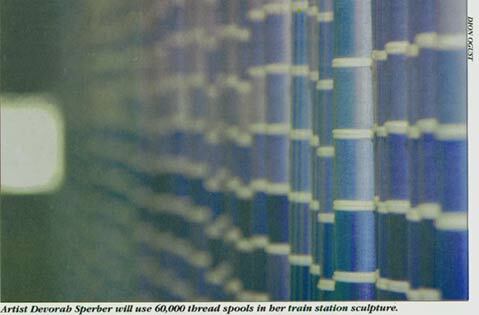 Sperber meticulously assembled thousands of elements--spools of thread or chenille stems, for example-- in such a manner that a recognizable image is surprisingly revealed when the sculpture is viewed through a clear acrylic sphere or curved mirror." Sperber describes the work as a "low-tech approach to science and technology," with which she is fascinated. Explaining the Puerto Rican commission, which will incorporate over 60,000 thread spools by the time it's finished, she charts the many little technical problems she's had to creatively solve along the way, from working with Kevin Brady of Precition Flow Technology in Saugerties on the piece's metal framework to hooking up with some of the nation's top museum conservators to find a way of coating the thread spools for cleaning and archival purposes, once the whole sculpture goes up. She shows a series of works involving chenille stems. They look like rugs, at first, until the right perspective shows them to actually be Vermeers, or in another case, a rendition of Salvador Dali's rendition of an early pixelation experiment with a well-known image of Abraham Lincoln. How do you frame such things? She found a form of rubber that met the need, but then had to find a cutter to create clean edges. "My father was an inventor-sort who revolutionized the insulation and fireproofing industries," she says. "That may be where I got my love for the problem-solving part of what I do." Sperber started off as a traditional sculptor working in stone but found she had to change her medium after moving to New York. A retrospective of Chuck Close works at the Museum of Modern Art was catalytic, showing her how pixel-elements of a painting could be used in a humanizing fashion. So she followed her instincts, talking down the "art critic voice" insider her to create pretty landscapes out of thread spools, and later the move into other artist's work, including a rug-like recreation of a Jackson Pollock drip painting. Sperber also notes how the labor-intensive nature of her work pushed it away from being object-oriented--meaning working to afford one's art by creating specific sculptures for sale-- towards larger installations paid for by grants and her own investment of added time. She sees what she's doing now as being "prompted by a larger carrot"-- working for rewards 10 and 20 years out rather than immediately. She is excited about her upcoming show, while simultaneously chastising herself-- lightly-- for having jumbled it and her big commission together in the same work period, due in June. She's excited about other commissions and museum shows coming up, from a piece at the Montclair Art Museum in New Jersey working with an Edward Hopper painting, as well as a room she wants to do based on forest scenes done in the same thread spool medium she's currently working within. "It's all about what you see," Sperber says excitedly about what she does. "It's also about the link between art and technology, about the ways in which artists have always been able to instinctively arrive at breakthroughs that science later confirms." And yet Devorah Sperber admits being humbled by the way her friends from Woodstock come down en masse for her openings, as they will this coming April 22. "There's a lot of luck in everything," she says. "And great beauty. And great happiness." All coming out of her mixture of high/low tech low/high art coming out of old/new Byrdcliffe.